Description of "Melting Everest & Falling Mountains"
This book presents vital aspects and events of Nepal including South Asia and Tibet. The writer has transformed realities in the form of essays. useful to all who are interested in Nepal and the region. We suggest spending few hours to go through it. This book is available also in e-book form. Mr. Hari Prasad Shrestha is a freelance columnist.He has served in Ministry of Finance, Nepal as Under -Secretary, Project Officer in UNDP Sierra Leone, Revenue Specialist UNDP South Sudan and RRP Officer at UNMISS. His writings are published in different journals. His contribution to social reform in the most remote part of the world as project officer for many years in the Karnali Zone of Nepal and the remote areas of Sub-Sahara of Africa has been praised by national and international authorities. Mr. Shrestha has wtitten three books entitled (1) "Public Finance and Revenue Administration in Nepal" (2) "Melting Everest and Falling Mountains"
Reviews of "Melting Everest & Falling Mountains"
The most important and valuable information for you. Imagine the next time you join a discussion about “Review of Book on Nepal, Tibet and South Asia ‘Melting Everest and Falling Mountains’”. When you start sharing the fascinating “Review of Book on Nepal, Tibet and South Asia ‘Melting Everest and Falling Mountains’” facts below, your friends will be absolutely amazed. 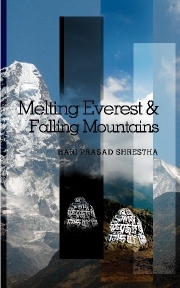 Expert author to the Ezine Aricles Mr. Hari Prasad Shrestha’s book ‘ Melting Everest and falling Mountains ‘ is compilation of proceedings and construct of Nepal, Tibet and South Asia. First part of writing of book unpack seriousness of ice-melting lady by worldwide warming. Furthermore,every day, most important of cubic meters of sand, boulder and aggregates are existence form exported as of Nepal to India to construct big infrastructures in India. These natural capital are removed as of riverbeds, riverbanks and too excavated as of the ground close to the foothills of the Chure hills. The removal of sand and boulders in Nepal can be seen in the majority of the rivers of southern Terai of Nepal. This exploitation labor of natural capital is rising in huge scale, additional than the bearing ability of the rivers and the hill slopes of Nepal. Major construct and house person’s name checkup in petroleum book. The heart-touching depiction of Tibetan refugees and skin of South Asian monetary system are additional topics of attention to the readers. The rear wrap of the book inappropriately – Former Chief of Staff of the Indian Army, Field Marshal Sam Manekshaw on one occasion famously supposed concerning Gurkhas: If a man inappropriately he is not frightened of dying, he is also lying or he is a Gurkha. Nepal is careful to be the world’s main museum. Nepal has forever person’s name careful as the holiest of the holy lands for the Hindu and the Buddhists. Still, the Nepalese communal arrangement unpack primeval characteristics, if a man is born as Kami (blacksmith) he lined be a Brahmin and Brahmin lined be a Kami. This minute state is bearing the influx of refugees. Tibetans are continuously crossing the risky Himalayan border to enter Nepal. Never-ending political transitional era has destabilized petroleum nation. Power lack has darkened the existence of populace and Nepal has lost its efficiency in implementing still little authority projects to fulfill its interior authority demands. Quota restriction and non-tariff barriers imposed by USA and India on main Nepalese manufacture crumpled exports of Nepal and the entire monetary system extremely old ailing following so as to intolerable fright. The author has depicted a marvellous image of Nepal as world’s main museum.. Since occasion immortal, Nepal has forever person’s name careful as the holiest of the holy lands for the Hindu and the Buddhists. Nepali populace are healthy recognized for completely language of generosity. All significant construct of the Himalayan nation is existence form enclosed by income of the center essays. Nepal’s agriculture sector is not in a state to still fulfill its families’ foodstuff requirements. Not merely in Karnali Zone but in ,whole Himalayan area of Nepal, the extended queues for rice contain person’s name never-ending phenomenon. If foodstuff grains had not person’s name imported and not distributed by the World Food Program of the United Nations, the foodstuff disaster counting contain person’s name extremely serious. This recreation the genuine state and growth rank of the agriculture sector in Nepal. Think about what you’ve read so far. Does it reinforce what you already know about “Review of Book on Nepal, Tibet and South Asia ‘Melting Everest and Falling Mountains’”? Or was there something completely new? What about the remaining paragraphs? The book earth to be grave concerning landlord’s exploitation of weaker communities for labor by power has person’s name a widespread phenomenon all in excess of the state in dissimilar names. Only the amount of exploitation is different. The author has praised INGOs as manager of communal change. INGOs may contain completely own dependable in entering villages of Nepal but anywhere government’s presence is zero NGOs are serving anyway in genuine punitive has person’s name praised by the writer. NGOs do not merely distribute foodstuff to hungry, clothes to naked people, and drug to the sick, but too advocate for the rights of the deprived. They labor by means of communities together, and initiate communal movement whenever ,essential in the procedure of empowering the people. In the part of writing article “Nation’s Failure by Power Failure “the author portrays so as to the reason origin difficulty of the authority sector in Nepal is due to instability and red- tapism and influential vested attention collection (water mafias). The by no means ending load-shedding has darkened the prospect of Nepali people. The world’s next main hydro authority possible state has person’s name in the center of the lowest authority producer of the world. The fine part of writing the Risky Himalayan Crossings the author has marvelously trial concerning difficulties faced by the Tibetans who desire to leave China from side to side crossing the Himalayas, hiding the eyes of Chinese security forces. He writes-There are equivalent odds of victory and disappointment. Many days, contain go by from side to side lonely mountains, still out of follow by the terror of existence form detained, a lot of era with no foodstuff and water. If befall ailing en-route, contain contain to take on completely journey in genuine condition, too. Some time, contain snooze beneath unlock sky of snow and wind. An normal in excess of and beneath aged being hardly can trek in so as to trails, who are caught attempting to cross the border frequently face torture and varying emotion of imprisonments. The author earth to be completely frustrated by means of the metropolitan mismanagement of the Kathmandu city. In the part of script Need for New Capital metropolis he says, the metropolis is suffering, as of deteriorating air quality, unplanned infrastructure and accommodation growth, environmental risks, irrigate contamination, be small of of enforcement of stricter environmental regulations, growth limitations of eating water, power, energy, roads and transportation. Trash piled up on the streets is a usual phenomenon and merely 5% of wastes are recycled. There are approximately no community transportation facilities by the government. Air pollution stay eager on the earth and contaminates it. Vehicles produce poison. Kathmandu is deteriorating to retain her beauty day by day and it counting not be exaggerating to say so as to the contemporary metropolitan nature has person’s name transforming eager on a gigantic squalid conurbation. The author filled so as to south Asia determination be a the majority important area of the utterance economy. The part of writing ‘South Asia: The Emerging Region for Trade and Investment’ portrays the high-quality prospect of all the knowledge obtainable of south Asia. How Nepal’s monetary system is ailing due to strikes and bandha. Mr. Shrestha’s part of writing ‘Strikes in Highways’ trial the internal strike difficulty of Nepal. Protests and demonstrations are frequent recurring occasion in Nepal and any time can twist violent. Political meetings and rallies get put all through the country. Tension recognized by rival political agenda can occur any time. Sporadic incidents of politically aggravated violent may carry on to occur all through the country. These are a number of of the small descriptions of the book but petroleum book obvious additional significant skin as well. In the part of writing the Dilemma of Economic Development External investors in Nepal do not sense extremely safe to invest. Infl uence of political parties and completely organizations, insecurity, authority shortage, feeble infrastructure, labour problems, strikes contain hampered industrial and commercial bottom in Nepal; Nepal has to re-think seriously. The language of the book is simple. A author as of the mid-western area of Nepal has complete huge attempt to mark primary book in English language. The readers in writer’s house town Nepalgunj, in Nepal as healthy as universal readers are advised to use few frequently to appreciate writing petroleum book. It is hard to discover genuine consolidated book on Nepal, Tibet and South Asia and hard to discover unenthusiastic be acquainted with of the book. This book has person’s name powered by pothi.com of Bangalore India. The readers can get print book (print on demand) or e-book by log in Pothi.com/pothi. This in,within trade print book and in,within interpretation facilities counting assist to the reader of Nepal and ability readers worldwide. Expert writer to the Ezine Aricles Mr. Hari Prasad Shrestha's book ' Melting Everest and falling Mountains ' is collection of events and issues of Nepal, Tibet and South Asia. First article of book indicates seriousness of ice-melting caused by global warming. Furthermore,every day, thousands of cubic meters of sand, boulder and aggregates are being exported from Nepal to India to build large infrastructures in India. These natural resources are removed from riverbeds, riverbanks and also excavated from the ground near the foothills of the Chure hills. The removal of sand and boulders in Nepal can be seen in most of the rivers of southern Terai of Nepal. This exploitation work of natural resources is increasing in massive scale, beyond the bearing capacity of the rivers and the hill slopes of Nepal. Major issues and realities been described in this book. The heart-touching depiction of Tibetan refugees and features of South Asian economy are other topics of interest to the readers. The back cover of the book says - Former Chief of Staff of the Indian Army, Field Marshal Sam Manekshaw once famously said about Gurkhas: If a man says he is not afraid of dying, he is either lying or he is a Gurkha. Nepal is considered to be the world's biggest museum. Nepal has always been considered as the holiest of the holy lands for the Hindu and the Buddhists. Still, the Nepalese social structure indicates primordial characteristics, if a man is born as Kami (blacksmith) he cannot be a Brahmin and Brahmin cannot be a Kami. This tiny country is bearing the influx of refugees. Tibetans are continuously crossing the risky Himalayan border to enter Nepal. Never-ending political transitional period has destabilized this nation. Power shortage has darkened the life of people and Nepal has lost its efficiency in implementing even small power projects to fulfill its internal power demands. Quota restriction and non-tariff barriers imposed by USA and India on major Nepalese production crumpled exports of Nepal and the whole economy became ailing after that intolerable fright. The writer has depicted a marvellous picture of Nepal as world's biggest museum.. Since time immortal, Nepal has always been considered as the holiest of the holy lands for the Hindu and the Buddhists. Nepali people are well known for their language of generosity. All important issues of the Himalayan nation is being covered by means of the core essays. Nepal's agriculture sector is not in a condition to even fulfill its families' food requirements. Not only in Karnali Zone but in entire Himalayan region of Nepal, the long queues for rice have been never-ending phenomenon. If food grains had not been imported and not distributed by the World Food Program of the United Nations, the food crisis would have been very serious. This shows the real condition and development status of the agriculture sector in Nepal. The book seems to be serious about landlord's exploitation of weaker communities for labor by force has been a widespread phenomenon all over the country in different names. Only the degree of exploitation is different. The writer has praised INGOs as agent of social change. INGOs may have their own objectives in entering villages of Nepal but where government's presence is zero NGOs are serving anyway in such areas has been praised by the writer. NGOs do not only distribute food to hungry, clothes to naked people, and medicine to the sick, but also advocate for the rights of the deprived. They work with communities together, and initiate social movement whenever necessary in the process of empowering the people. In the article article "Nation's Failure by Power Failure "the writer portrays that the cause root problem of the power sector in Nepal is due to instability and red- tapism and powerful vested interest group (water mafias). The never ending load-shedding has darkened the future of Nepali people. The world's second largest hydro power potential country has been among the lowest power producer of the world. The fine article the Risky Himalayan Crossings the author has marvelously explains about difficulties faced by the Tibetans who want to leave China through crossing the Himalayas, hiding the eyes of Chinese security forces. He writes-There are equal chances of victory and disappointment. Many days, they pass through lonely mountains, even out of trail by the fear of being detained, many times without food and water. If befall ailing en-route, they have to carry on their journey in such condition, too. Some time, they snooze under open sky of snow and wind. An ordinary over and under aged person hardly can trek in that trails, who are caught attempting to cross the border often face torture and varying periods of imprisonments. The writer seems to be fully frustrated with the metropolitan mismanagement of the Kathmandu city. In the piece of writing Need for New Capital city he says, the city is suffering, from deteriorating air quality, unplanned infrastructure and housing growth, environmental risks, water contamination, lack of enforcement of stricter environmental regulations, growth limitations of drinking water, power, energy, roads and transportation. Trash piled up on the streets is a normal phenomenon and only 5% of wastes are recycled. There are almost no public transportation facilities by the government. Air pollution gets into the soil and contaminates it. Vehicles emit poison. Kathmandu is failing to retain her beauty day by day and it would not be exaggerating to say that the modern metropolitan character has been transforming into a gigantic squalid conurbation. The writer believes that south Asia will be a leading region of the word economy. The article 'South Asia: The Emerging Region for Trade and Investment' portrays the good future of all the eight countries of south Asia. How Nepal's economy is ailing due to strikes and bandha. Mr. Shrestha's article 'Strikes in Highways' explains the inner strike problem of Nepal. Protests and demonstrations are frequent recurring event in Nepal and any occasion can turn violent. Political meetings and rallies take place throughout the country. Tension between rival political groups can happen any time. Sporadic incidents of politically motivated violent may continue to occur throughout the country. These are some of the short descriptions of the book but this book contains other important features as well. In the article the Dilemma of Economic Development External investors in Nepal do not feel very secure to invest. Infl uence of political parties and their organizations, insecurity, power shortage, weak infrastructure, labour problems, strikes have hampered industrial and commercial base in Nepal; Nepal has to re-think seriously. The book ‘ Melting Everest and falling Mountains ‘ written by columnist and contributor to the American Chronicle Mr. Hari Prasad Shrestha, is a masterpiece of extraordinary collection of real events and issues of Nepal, Tibet and South Asia. The heading of book itself indicates seriousness of ice-melting and natural degradation caused by global warming. The rapid climate change around Mount Everest and Himalayas is transmitting dangerous massage of uncertain future not only the billions inhabitants dependent on water and natural resources of Himalayas but also cautioned the industrialized nations as well , who gifted global warming to the globe. Important issues and realities of Nepalese history, politics and society been mirrored in this book. Besides, heart-touching descriptions of Tibetan refugees and emerging features of South Asian economy are other topics of interest to the readers. The gist of the book - Former Chief of Staff of the Indian Army, Field Marshal Sam Manekshaw once famously said about Gurkhas: If a man says he is not afraid of dying, he is either lying or he isa Gurkha. Nepal is considered to be the world’s biggest museum. Nepal has always been considered as the holiest of the holy lands for the Hindu and the Buddhists. Still, the Nepalese social structure indicates primordial characteristics, if a man is born as Kami (blacksmith) he cannot be a Brahmin and Brahmin cannot be a Kami. This tiny country is bearing the influx of refugees. Tibetans are continuously crossing the risky Himalayan border to enter Nepal. Never-ending political transitional period has destabilized this nation. Power shortage has darkened the life of people and Nepal has lost its efficiency in implementing even small power projects to fulfill its internal power demands. Quota restriction and non-tariff barriers imposed by USA and India on major Nepalese production crumpled exports of Nepal and the whole economy became ailing after that intolerable fright. Mr. Shrestha’s analysis in many article are full of national sentiments. His suggestions are not only practical but also come from love for Nepal. The book’s descriptions are meticulous and practical regarding Nepal. The writer has depicted a marvellous picture of Nepal as world’s biggest museum. The three cities of the Kathmandu valley are telling their tales of centuries. Since time immortal, Nepal has always been considered as the holiest of the holy lands for the Hindu and the Buddhists. Nepali people are well known for their language of generosity. Almost every facet of Himalayan nation is being covered in a practical way by means of the core essays. The writer has cautioned the Nepalese authority on degrading agriculture production and seems very serious on food crisis of the Himalayan region. Nepal’s agriculture sector is not in a condition to even fulfil its families’ food requirements. Not only in Karnali Zone but in entire Himalayan region of Nepal, the long queues for rice have been never-ending phenomenon. If food grains had not been imported and not distributed by the World Food Program of the United Nations, the food crisis would have been very serious. This shows the real condition and development status of the agriculture sector in Nepal. The book seems to be positive toward some of the reformation of Nepal. INGOs may have their own objectives in entering villages of Nepal but where government’s presence is zero NGOs are serving anyway in such areas has been praised by the writer. NGOs do not only distribute food to hungry, clothes to naked people, and medicine to the sick, but also advocate for the rights of the deprived. They work with communities together, and initiate social movement whenever necessary in the process of empowering the people. Among the seriously filled article “Nation’s Failure by Power Failure “the writer clearly says that the cause root problem of the power sector in Nepal is due to instability and red- tapism and powerful vested interest group (water mafias). The never ending load-shedding has darkened the future of Nepali people. The world’s second largest hydro power potential country has been among the lowest power producer of the world. In the article the Risky Himalayan Crossings the author has marvelously explains about difficulties faced by the Tibetans who want to leave China through crossing the Himalayas, hiding the eyes of Chinese security forces. He writes-There are equal chances of victory and disappointment. Many days, they pass through lonely mountains, even out of trail by the fear of being detained, many times without food and water. If befall ailing en-route, they have to carry on their journey in such condition, too. Some time, they snooze under open sky of snow and wind. An ordinary over and under aged person hardly can trek in that trails, who are caught attempting to cross the border often face torture and varying periods of imprisonments. The writer seems to be fully frustrated with the metropolitan mismanagement of the Kathmandu city. In the piece of writing Need for New Capital city he says, Kathmandu is failing to retain her beauty day by day and it would not be exaggerating to say that the modern metropolitan character has been transforming into a gigantic squalid conurbation. The writer is optimistic on the future of south Asia. He believes that south Asia will be a leading region of the word economy. The article ‘South Asia: The Emerging Region for Trade and Investment’ portrays the bright future of all the eight countries of south Asia. How Nepal’s economy is ailing due to strikes and bandha. Mr. Shrestha’s article ‘Strikes in Highways’ explains the inner strike problem of Nepal. Protests and demonstrations are frequent recurring event in Nepal and any occasion can turn violent. Political meetings and rallies take place throughout the country. Tension between rival political groups can happen any time. Sporadic incidents of politically motivated violent may continue to occur throughout the country. These are some of the short descriptions of the book but this book contains other important features as well. This non-fiction publication has been powered by pothi.com of Bangalore India. The readers and book stores can obtain print book (print on demand )or e-book by logging on Pothi.com/pothi. This new online buying print book and online reading facilities for the reader would be new attraction for the reader of Nepal and facility for the readers worldwide.